Yesterday I got an incredible nice surprise on Netflix. I found a German Science Fiction film called Iron Sky. It was made in 2012 and an independent film without big studio backing. Those of us who love science fiction are familiar with the theory that some Nazis fled at the end of World War II and set up a colony of the dark side of the moon. This movie begins in 2018 when two American astronauts land on the moon. A few minutes after leaving the lunar module, they run right into some evil looking men who are obviously in Nazi space suits. One astronaut is shot dead and the lunar module is destroyed. The other astronaut is captured alive and hauled back to the colony that is obviously a major Nazi outpost. When the astronaut’s helmet is removed, the Nazis are shocked to see that he is an African American. Of course he is tortured and imprisoned. He does manage to escape and somehow makes his way back to earth. In the future world of 2018 America has a female president and she is the twin of Sarah Palin including the glasses. One thing leads to another and the moon Nazis send an invasion fleet to conquer the world. An American space cruiser is sent to engage the Nazis. Its name is “The USS George W. Bush.” It is made clear that it’s nuclear armed. The Sarah Palin look alike is warned that if nuclear weapons are used, innocent women and children could be killed. Her response in the film is: “I don’t give a damn, nuke ’em!” Of course the American stop the Nazi invasion. This film is full of great special effects, humor and satire. It was great fun to watch. But it also had a deeper message that Europeans often see we Americans as “trigger happy cowboys who shoot first and ask questions later.” The website for the film is ironsky.net. This is a great film and I had a lot of fun watching it. Beware Internet Scammers Are Getting Very Good!!!! Yesterday I got a very official-looking email telling me that my American Express card had been frozen due to a security issue. I was told to go to a website and give information. On one hand, I thought the email might be legitimate as I had just used the card to buy a couple of books at a book seller in South Africa who I have done business with for decades. On the other hand I as very suspicious and felt uncomfortable about the whole thing. I took the time to call American Express. There was no security hold on my account. The whole email had been a trick to try to get me to give up all the information on my American Express card so that thieves could drain it of money. My friends be alert at all time. Yesterday I got to call Elena at her friend’s house in Buenos Aires and wish her a happy birthday. She was in good spirits. Later in the afternoon I got to watch episodes of Dragnet screened on television between 1950 and 1953. I was alive then but we did not have a television all of those years ago. I guess that you can say that I am “catching up on things.” These episodes show that over 60 years ago police had to deal with things like serial killers, teenagers dying from heroin overdoses, street gangs, etc. The police are shown as being decent and over worked. What is not shown there is police beating suspects, etc. Mike “Mish” Shedlock is a conservative financial blogger. We do not always agree on ideology. He is, without doubt, a damned smart man and I learn a lot from him. He posted a fascinating article about a robot that is taking jobs away from humans. I am sharing the article below. The bottom line is that it is super important for yung people to have incredible skills to survive in a work and economic world that is going to be more and more competitive. The federal Minimum wage in the US is $7.25 per hour. Ten states have higher minimum wages with Rhode Island clocking in 50 cents higher at $7.75. Costs to the employer are higher of course, even if the employer ducks benefits by using part-time workers. For starters, employer contributions to Social Security are 6.2% of hourly wages which adds another 45 cents to employer costs. That brings employer costs up to $7.95 per hour minimum, not counting training costs, vacation (if any), sick-time disruptions, and other such costs. Of course, employers must also factor in the cost of Obamacare. Small businesses do not have to provide health-care, but under employer responsibility provisions of the affordable care act, businesses that employ more than 50 workers will pay a steep penalty in 2014 if they don’t. Click on the preceding link to see a nice flow chart of the penalty process. What if companies, small or large, did not have to worry about Obamacare? What if they did not have to worry, about training, sick-leave disruptions and weather-related disruptions? What if companies only had to pay $3.00 per hour, rivaling wages in China? 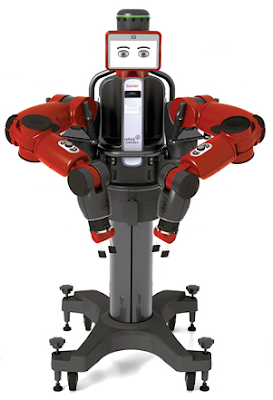 MIT Technology Review discusses Baxter in Small Factories Give Baxter the Robot a Cautious Once-Over. Chris Budnick, head of Vanguard Plastics, a small injection-molding operation in Southington, Connecticut is considering the use of Baxter for one process that is not yet automated: stacking and packing textured, plastic cups, which Vanguard sells for 2 cents apiece to a medical company. It currently costs Budnick $9.00 an hour to have a staffer from a temporary agency to do the job. Budnick is now considering Baxter to replace that agency job. Let’s tune in to the MIT story for additional details about Baxter and the job Baxter will replace. Baxter was conceived by Rodney Brooks, the Australian roboticist and artificial-intelligence expert who left MIT to build a $22,000 humanoid robot that can easily be programmed to do simple jobs that have never been automated before. Brooks’s company, Rethink Robotics, says the robot will spark a “renaissance” in American manufacturing by helping small companies compete against low-wage offshore labor. Baxter will do that by accelerating a trend of factory efficiency that’s eliminated more jobs in the U.S. than overseas competition has. Of the approximately 5.8 million manufacturing jobs the U.S. lost between 2000 and 2010, according to McKinsey Global Institute, two-thirds were lost because of higher productivity and only 20 percent moved to places like China, Mexico, or Thailand. The ultimate goal is for robots like Baxter to take over more complex tasks, such as fitting together parts on an electronics assembly line. “A couple more ticks of Moore’s Law and you’ve got automation that works more cheaply than Chinese labor does,” Andrew McAfee, an MIT researcher, predicted last year at a conference in Tucson, Arizona, where Baxter was discussed. Baxter comes with two arms, a vision system, and 360° sonar (which it uses to detect people nearby), but for the cup-stacking job it will also need a specially designed gripper, which Rethink is now developing. Rethink is also developing software so that the robot can communicate with other machines, such as a conveyor belt, telling it to move forward or stop. Inquiring minds are listening to a 13 minute video on 60 Minutes that discusses “The Age of Robots”, and Baxter. Please play the video. It’s well worth your time. Here is an interesting Email exchange I had with a few friends, one of which sent me the MIT article. “Mish” says, I fail to see where the above line of thinking goes. We have come to a point where the minimum wage is 200% too much. How does hiring Baxter at $3.40 per hour prevent slave labor in China? Is no job better than some job? Baxter is a hugely deflationary force. Increasing the minimum wage only exacerbates the problem. Oddly enough, Paul Krugman agrees, or at least he once did before he became the “Conscience of a Liberal“. Want proof? Please consider In Praise of Cheap Labor; Are Bad Jobs at Bad Wages Better than No Jobs at All? Economist Paul Krugman and others are now pondering heavy taxes on robots. Is that the answer? How can it be? Paying more people to do nothing (or to do jobs robots can do cheaper) cannot possibly solve anything. Such practices encourage the birth of more people when there are fewer jobs to be had. Either technology creates jobs long-term or it doesn’t. I believe it does, and on that score I am an optimist (I just cannot say when it will happen). Let’s assume I am wrong. Then taxing robots to meet some artificial living-wage standard can hardly be the answer. Encouraging the birth of more unneeded, unproductive people is a sure-fire way to start a major war. In either reality, Krugman is wrong. The problem is not that wages are too low. Rather, the problem is expenses are two high. The remedy then is certainly not higher minimum wages (which previously encouraged more outsourcing and now encourages more robots), but rather making the dollar go further. In that regard, it’s a mad world in which the central bankers and the Keynesian clowns are both hell-bent on forcing wages and prices up, when every attempt to do so accelerates the use of more robots. There is nothing wrong with falling wages provided costs fall as well. Who (other than Keynesian clowns and misguided union activists) does not want lower prices? Moreover, falling prices as a result of increasing productivity over time is the natural state of affairs. For example, one farmer today produces as much goods as 100 farmers a few decades ago. Certainly the price of agricultural goods is up over that time frame, but far less than the corresponding increase in money supply and credit (the true measure of inflation). Central banks are powerless to stop the advance of technology. Robots in particular are an invincible force. The Fed, central banks, and governments around the globe need to embrace technology and its deflationary forces. Otherwise, the result will be a sad combination of fewer jobs, rising population, higher prices, and a ultimately a major war. Yesterday was a beautiful day and it was really great to see the president and vice-president sworn in. I was fascinated at some of the body language things I detected. When President Obama and former President Clinton met they were polite but distant. I think Clinton still has grievances over the 2008 election when Hillary lost to Obama. Most fascinating was Michelle Obama’s body language and reactions. She loves Joe Biden. She likes Harry Reid somewhat. She despises John Boehner. Elena got to watch the event also. I had to go to Kaiser to get my blood drawn to see how my cholesterol is doing. (I got the results later and they are good; thanks to cholesterol medicine.) I took her to the airport after 12 and she flew to Houston and then to Buenos Aires. I went to Loew’s and got 15 more blocks to fix the entrance to our driveway. I installed them and enjoyed a beautiful afternoon with the dogs. Now I am alone until Luah returns on 3 February. One of my passions in life is collecting refrigerator magnets from all of the places that I have been in the world. I am almost complete thanks to the people at Cafe Press. Elena does not like them at all. I Just Want To Celebrate Another Day Of Life! Copernicus as the old saying goes: “I was born at night but not last night.” Eleven years ago tonight your mother Eloisa went into labor in the area near the dining room in our old townhouse in San Jose. You were the first to be born. You came into the world blind and with no fur. You were so tiny that I could hold you in my hand. Your father was a sweet little white dog named Virgilio. Your mother arrived from Argentina pregnant with you. It was fortunate that you were born with us. Had you been born in Argentina, Patricia’s husband would have taken you out and killed you because they could not afford puppies. As a puppy you were sweet. You loved to sit out on the patio and look up at the heavens. We gave you the name Copernicus after the Polish astronomer Copernicus because you were fascinated with the heavens. We thought that you would grow up to be sweet like your father. Instead you grew up to be strong and aggressive. You have escaped many times and survived in dangerous places full of coyotes, mountain lions, and very unpleasant humans. You have had “run ins” with animal control in two California counties and a couple of law enforcement agencies. The lawyer Krisana Hodges once had to defend you from a civil claim after you bit a UPS driver. You are a little man with incredible resourcefulness and street sense. We love you and thank you for eleven years of love, loyalty and devotion.